Cubbon Park is Bengaluru's equivalent of Central Park: a place of relaxation, open space and some worthwhile attractions. In and around the park are the State Central Library, two municipal museums, an art gallery and the Government Aquarium. The intensely red Attara Kacheri, which houses the regional high court, is unmistakable and eminently photogenic. The State Archaeological Museum is one of the oldest in India, has artefacts dating back 5,000 years, and is well worth a visit to gain some historical context to this relentlessly modern city. The handsome and photogenic Seshadri Memorial Library is another distinctly red building on the fringes of the park. At the northern edge of Cubbon Park is the imposing Vidhana Soudha, home to the State Legislature and Secretariat. The massive sandalwood doors to the Cabinet are a notable feature of this handsome colonial structure, built in a neo-Dravidian style. The construction work was done by more than 5,000 prisoners, who were set free once the building was finished, in 1956. First and foremost, however, the park is a green lung, a peaceful and pretty place to take a break from the traffic and noise of this bustling city. It is a great area for walkers and joggers - particularly early in the morning and in the evenings. 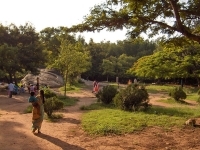 Tourists travelling with kids in Bengaluru will find Cubbon Park has many lovely picnic spots and open space to let off some steam; there is also boating on the lake and a toy train that runs around the park. Note that there is a busy road running through the area so it is not completely devoid of traffic.